barilla pasta | Crappy Kitchen - Good Dinners! 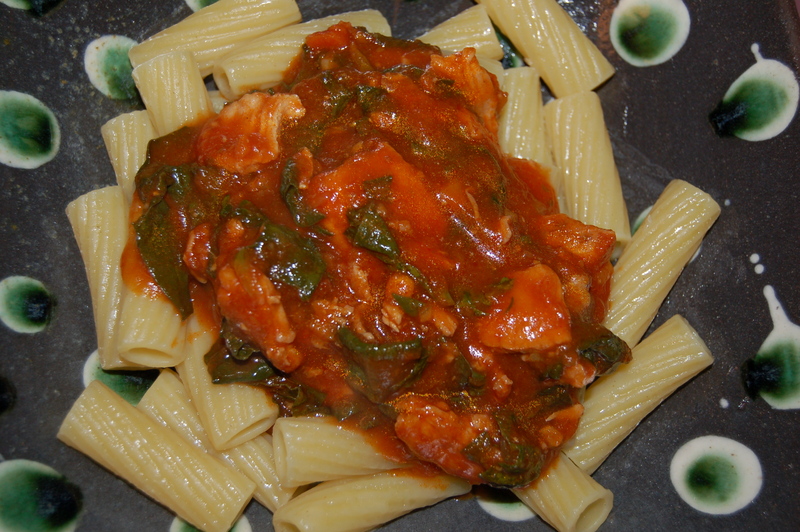 Light Chicken Ragu with Shells (serves 6) And a Word on Economy! 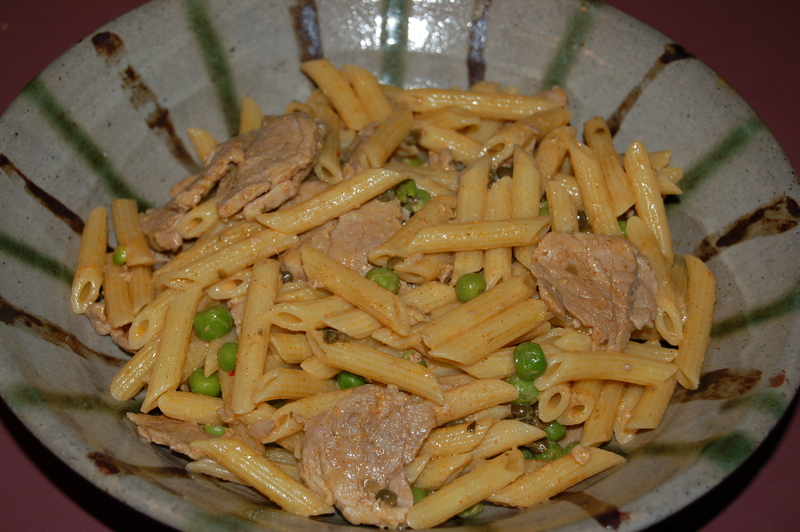 Here is a great pasta dish that feeds a crowd without spending a ton of money! Even if you are very well off and budgeting for food is not high on your list, I think there is always room for economy. 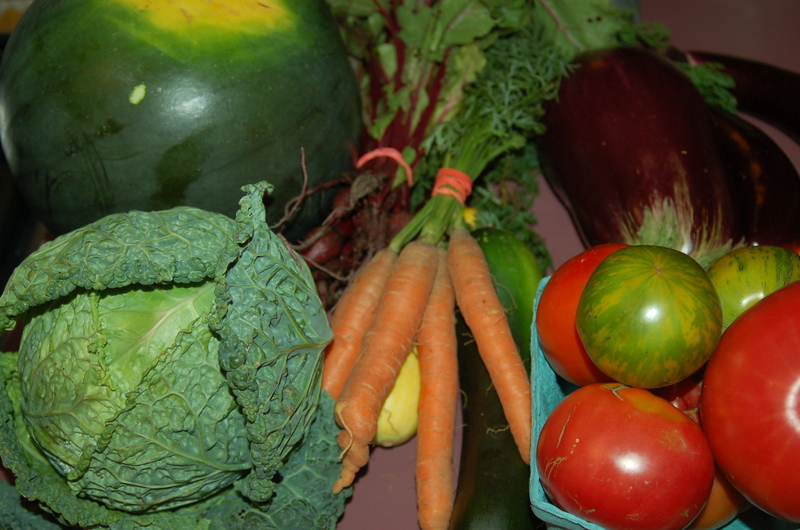 When it comes to food, I am mindful of every scrap I decide to put into my shopping basket. Someone, somewhere in the world is hungry so buying food is a privilege that shouldn’t be taken lightly by anyone, regardless of their income. With a little bit of though, the most lowly ingredients can be made to taste delicious, and this recipe is a prime example of Deliciousness and Economy. When I sit around with my family over dinner we sometimes play the game of “how much did this dinner cost?” I really think it is important for my kids to have an understanding of how money plays a part in their lives but that it is certainly not the thing that defines their ultimate happiness. And this is not a big philosophical commentary on how money can’t buy you love etc etc. It is a very practical matter to me when it comes to equating quality food with money: I just don’t. My two children love that something can be made from so little and it excites them to think that as a very general rule, most people can afford to choose something good to eat over something mediocre. How many times have we gone to restaurants and my kids leave saying that they could have had something better at home and not wasted money. To me, buying a nice bottle of wine and eating at home is far more satisfying than eating out. That’s not to say that when the opportunity arises to eat some place fantastic that we don’t jump at the chance. What I am trying to say is that there is a difference between eating crap (whether bought ready-made crap, or from a crappy restaurant) or making it a rule to eat at home prepared with decent ingredients and eating out when you have chosen some place wonderful (this could be a crab shack on a beach or a fancy place in a city somewhere). 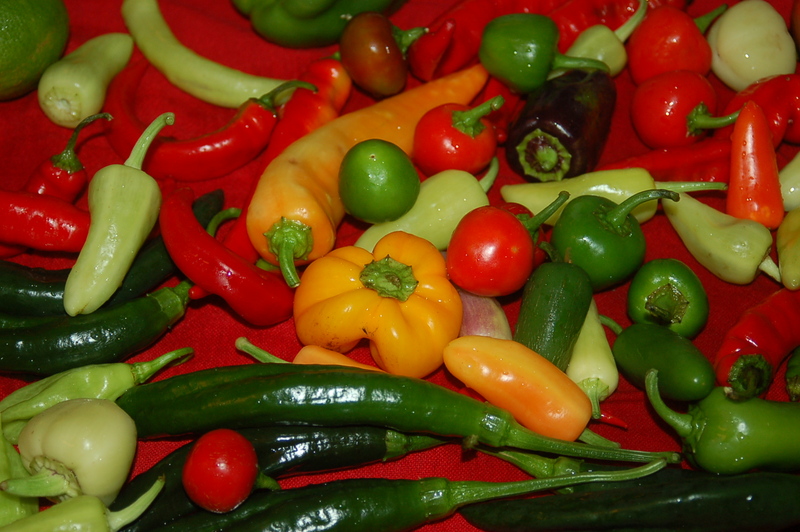 lots of peppers from my garden & from next door! There are so many places to find good ingredients for very little. Besides shopping for bargains in the supermarket, there are all sorts of people in the summer and autumn selling produce from their own gardens: vegetables, fresh eggs, even meat. 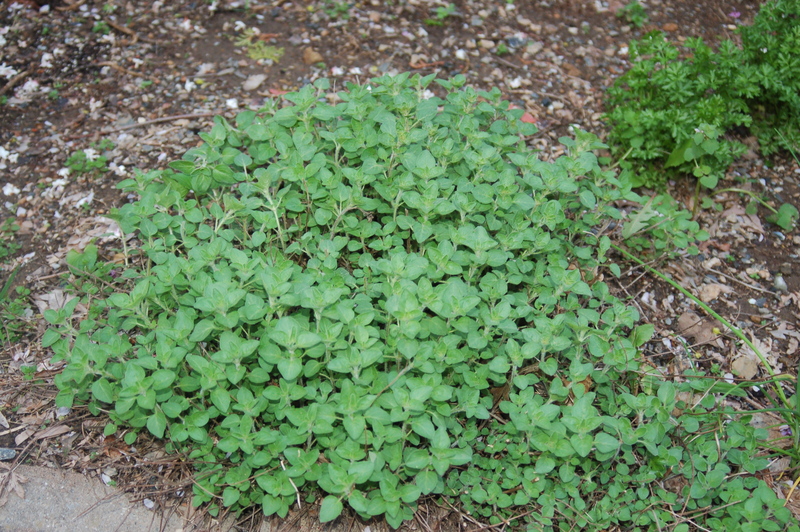 I have the puny-est garden myself but I grow as much as I can in the summer (especially herbs) to add to my meals. I’m not even that good at it but I get no end of pleasure out of whatever appears, however sad it may look! So maybe you might consider cooking a couple of times this week and be smug over how good it tastes and how much you saved! 1 – Put big saute pan or saucepan on medium heat and add the oil. 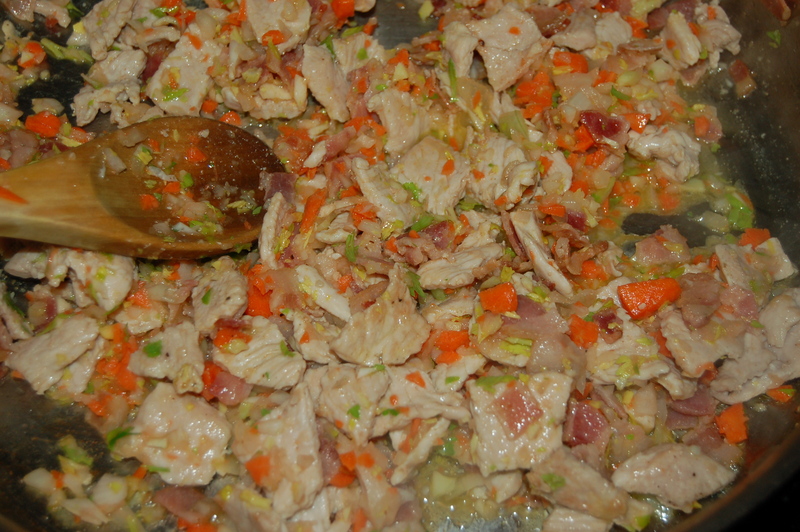 Add the onions, garlic, and celery and saute for about 5 minutes, stirring occasionally. Turn heat up slightly and add the sausage and as it cook, break it up into smaller pieces with your wooden spoon. Cook for about 10 minutes. 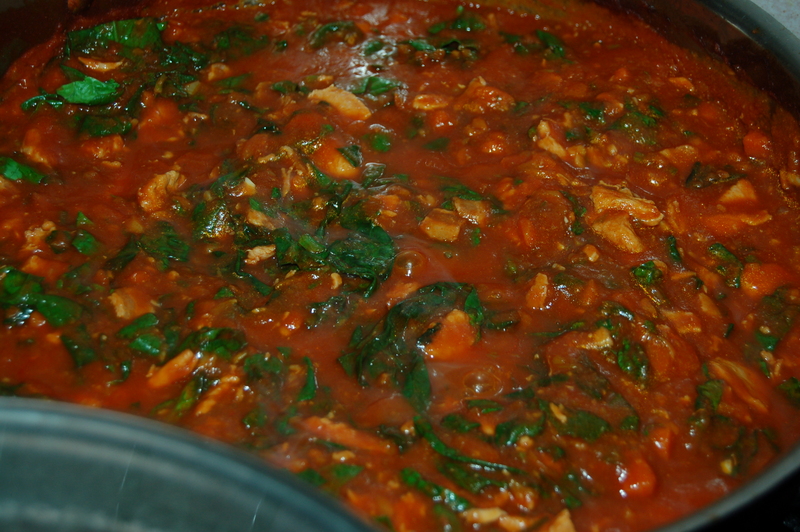 2 – Add the tomato puree, broth, herbs, pepper flakes, salt, pepper, and carrots to the pot and bring everything to a simmer. Cover with lid and simmer for about 25 minutes (the sauce should always have a slight bubble to it while it is cooking). Stir occasionally. *In the meantime put water on for pasta and cook according to instructions. time the shells to be ready at the same time the sauce is cooked. Scoop out about a 1/2 cup of the pasta cooking water before draining and do not rinse shells in cold water. 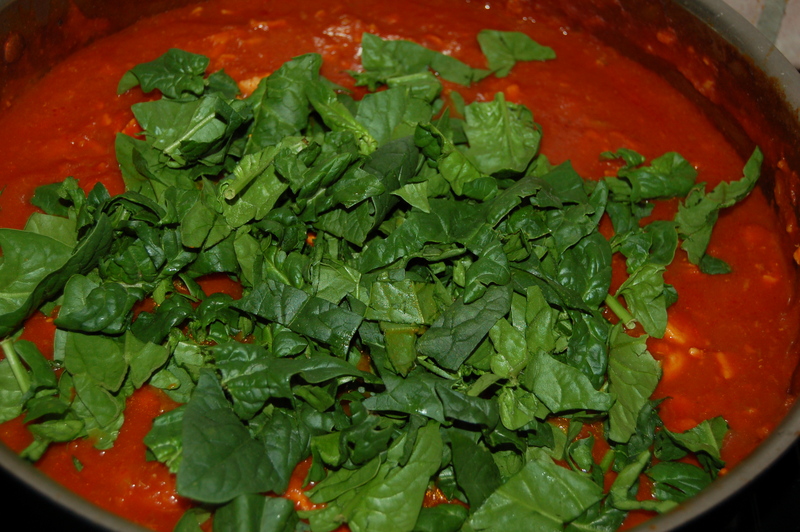 3 – Add the spinach and cover with lid. Cook for another 3 minutes. Turn off heat and stir sauce. Taste and adjust seasoning if necessary. 4 – When pasta is ready pour the drained pasta directly into the cooked sauce, adding the pasta water if you want a looser consistency. Divide between 6 warmed plates or bowls and pass some Parmigiano Reggiano to anyone who wants it! This was a great mid-week dinner. Wednesday is the day my kids are a little tired of the school week but in the evening are beginning to look forward to the weekend (I know that’s wishing their young lives away, but this is a hard lesson to teach little people who think they will live forever!). I put this sauce together the moment I got in the door and that left me free to do all of those other things that needed to be taken care of (science project panic!). 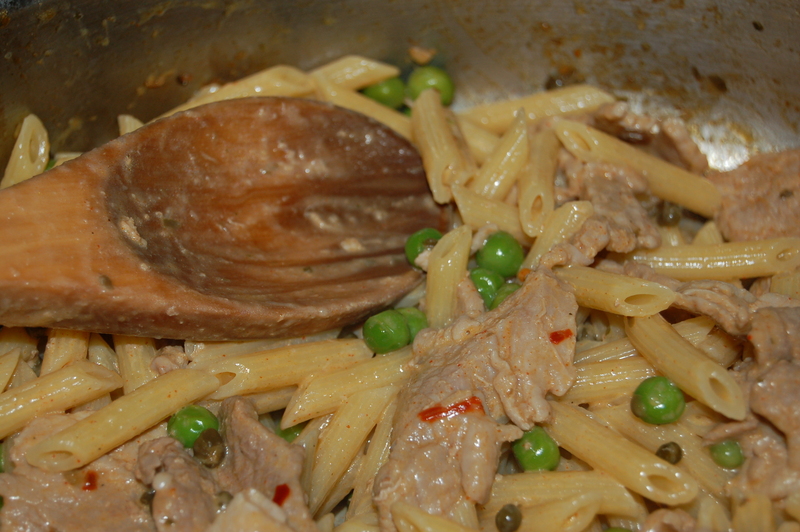 I wanted to use a lighter meat for the ragu and I had some turkey that I though would work. It was not ground, but that didn’t bother me (Ragu is made with ground meat but f you don’t have it, don’t worry about it). I was a little concerned with the meat not having as much flavor as say lamb or pork, so I added some bacon. I think bacon is the secret ingredient that waylays lots of disasters! It was really lovely and made the hum-drum feeling that Wednesdays can bring fade away. 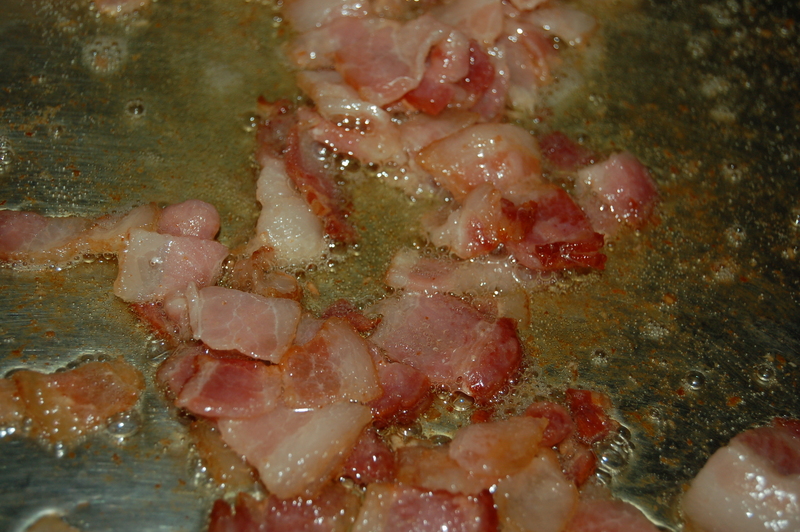 1 – Put large saute pan on medium heat and add the oil and chopped bacon. 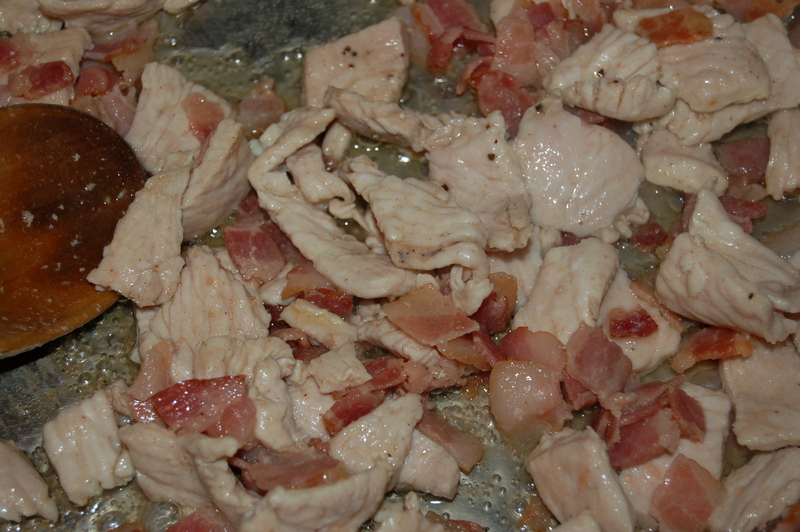 Cook until bacon starts to get crispy (anywhere from 8 to 10 minutes). 2 – Season the turkey with the salt and several grinds of black pepper and add to the pan. You will have to turn up the heat slightly. Cook turkey until it takes on a white color (about 5 to 8 minutes). Stir occasionally. 3 – While meat is cooking, prep the veggies: slice carrot, onion and celery into chunks and add to a food processor with the garlic cloves. Pulse until it resembles large rubbly bits. 4 – Add the veggies to the pan and cook for about 6 to 8 minutes (adjusting the heat down slightly). 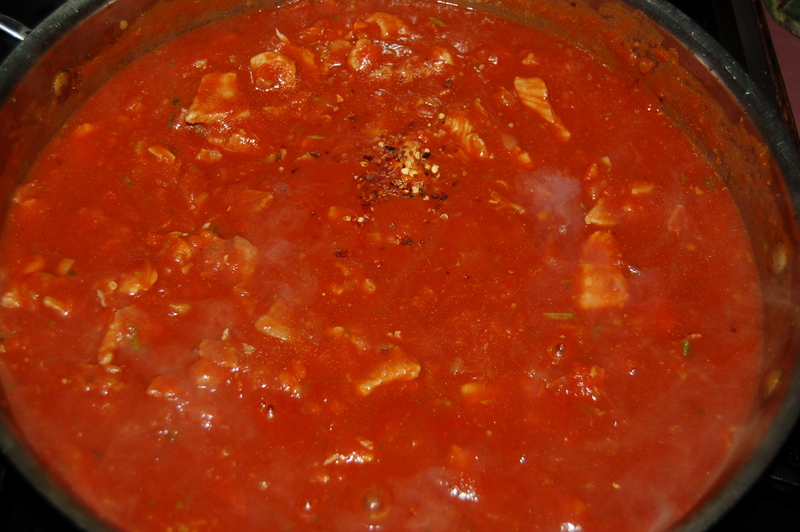 6 – Add the tomato paste, tomato puree, water, and chili flakes. Bring to a boil. When it boils, turn it down, cover and simmer at a bare bubble for about 2 hours. Check every 1/2 hour (or less) and give it a stir. If it gets very thick, add a 1/2 cup of water at a time to adjust consistency. However, it should be very thick. 8 – Cover and cook for a further 12 or so minutes, stirring once during this time. Turn off heat. Taste sauce and adjust seasoning if necessary (salt, and/or pepper). If it is thicker than you would like, add some of the reserved pasta cooking water. Stir butter (if using) into sauce. Divide pasta between warmed shallow bowls or plates and top each with a helping of Ragu. Pass some grated Parmigiano Reggiano and pepper flakes at the table. If you only have 1 measly piece of chicken breast in your fridge, as I had last night, along with a 1/2 head of escarole and enough pastina (tiny pasta) to almost fill a 1/2 cup measure, then this is the dinner for you! Soup has an uncanny knack of pretending to be more than it is, and frankly puts the Loaves & Fishes parable to shame. I can’t admit to being very “holy” but the parable of the Loaves & Fishes always intrigued me: I just think it should have been soup, far more believable. If you don’t believe in miracles, invite 6 people over and make this soup. You may need a loaf of bread to go along with it. 1 – Prep all veggies and chop chicken. 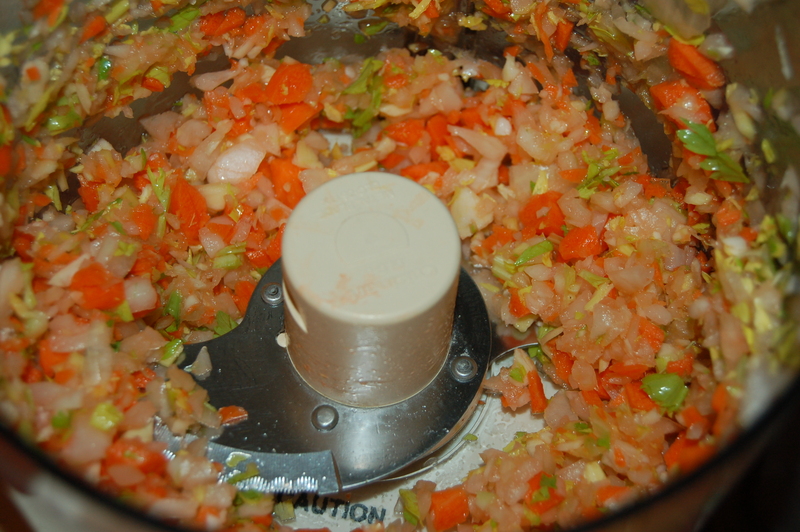 2 – Put med/large soup pot on medium heat and add oil. When it warms, add onions and cook, stirring occasionally for 5 minutes. 3 – Add mushrooms and continue to cook for another 8 or so minutes. The mushrooms and onions will become soft and sweet. 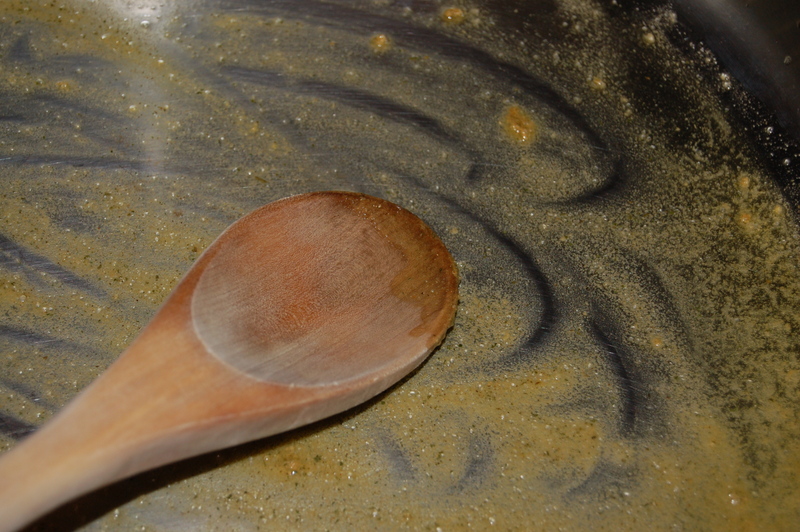 4 – Add the curry powder and mix. Add the stock cube and cook until dissolved. 5 – Add the water and escarole and bring to the boil. Add salt and several grinds of pepper. 6 – Turn up the heat and add the chicken. When liquid comes to a boil, turn the heat down to low, cover and cook for about 10 minutes. Do not let boil. 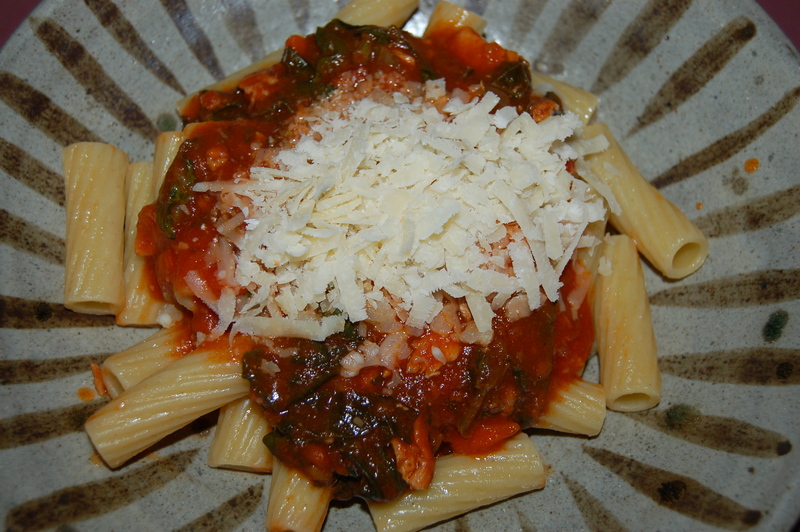 7 – Add pasta and cover. Cook for another 5 minutes. Turn off heat and let soup sit for 5 to 10 minutes before serving. Serve with lots of crusty bread (and wine!). You can garnish with more pepper and even a hot sauce of your choice. 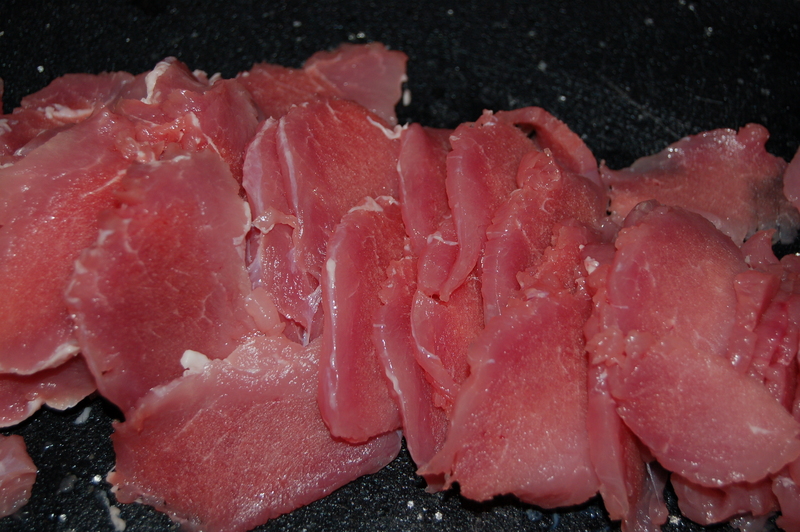 A few days ago I posted a recipe just to demonstrate how frozen pork tenderloin could be sliced and used handily, (Pork Stir-Fry). Well, here is another one. I cannot tell you how convenient it is to have ingredients like a quick-cooking meat and baby peas in the freezer. Yes, I come off as being boringly organised in the kitchen, but it is because I am just the opposite that I make sure to have food like this stashed away! It rules out a lot of thinking and planning. I will say that I am good at winging-it in the kitchen, so not knowing what I am going to cook each evening is more of a joy than a challenge (my one talent). But, if you’re not a fly by the seat of your pants style cook, this is a great recipe for you. It is also ideal for a crowd, so double the amounts and have a party! 2 – Put large saute pan on low/medium heat, (large enough for the whole dish). Add the oil and when it warms swirl in the stock cube and stir until dissolved. 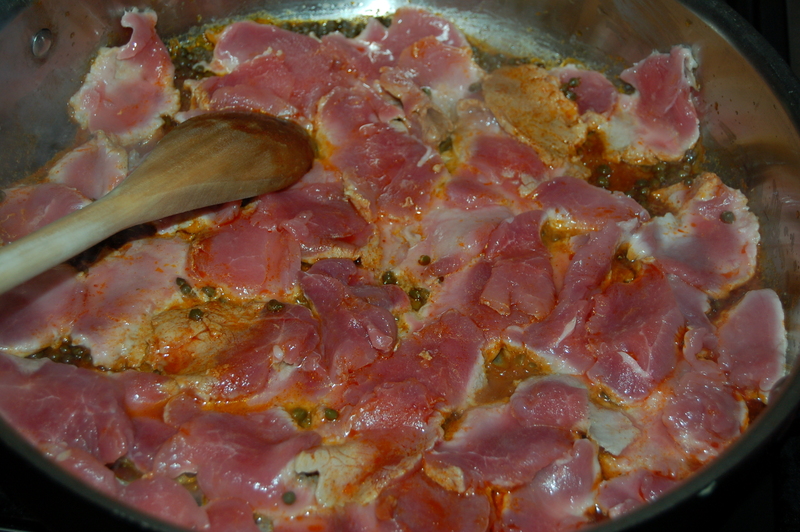 3 – Add the capers and stir to cook in for a minute. Add the paprika and pepper flakes and continue to cook for another 2 minutes. 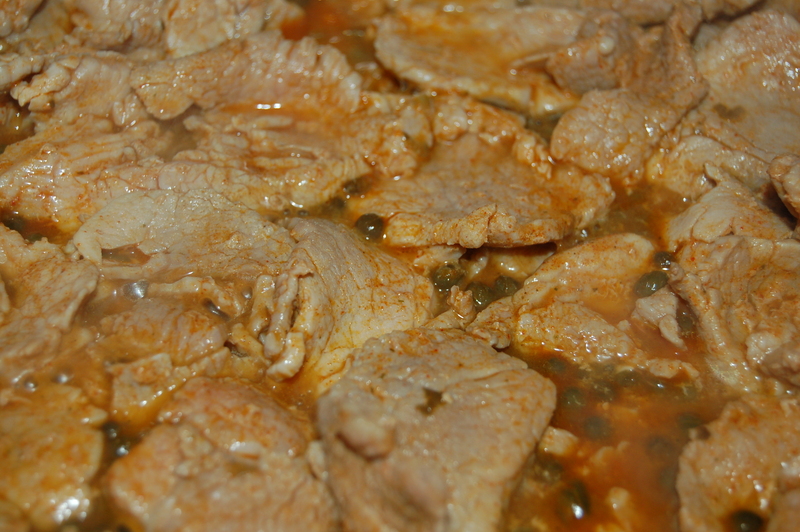 4 – Turn heat up to close to high and add the pork. Arrange on the pan in an even layer and let it cook undisturbed for about 3 minutes, (it will get liquid-y). 5 – Turn and allow to cook for another 3 minutes or so, after which point it should be nice and tender. 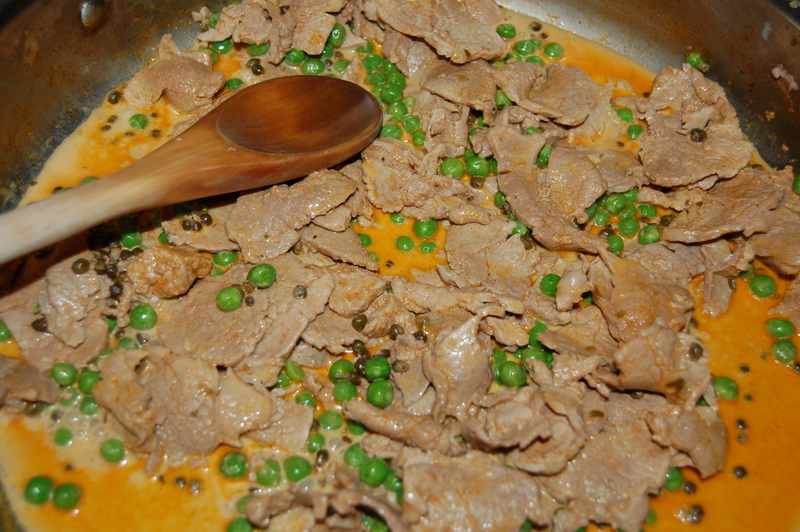 6 – Add the peas and cook for another minutes. Turn heat down to low (or just above) and add the cram and water. Cover and cook for about 4 minutes. Taste for addition of salt and pepper and add accordingly. 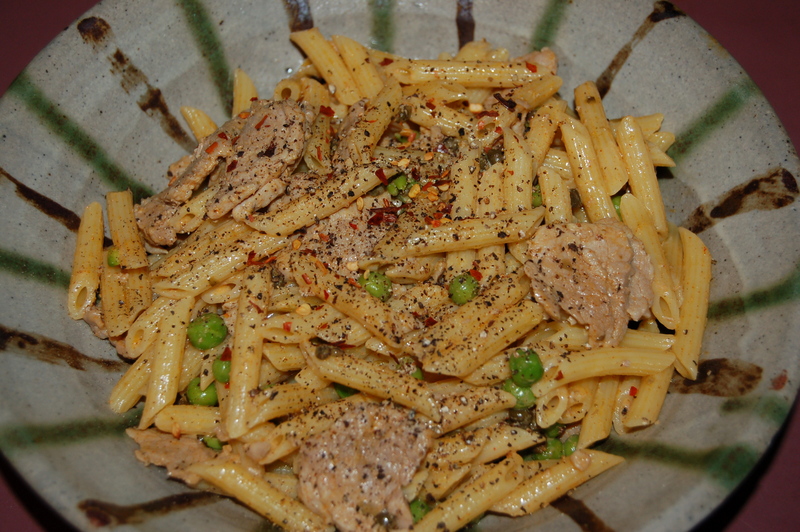 7 – Add the cooked pasta and the optional butter and mix together. If you need to loosen up the pasta you can add a little more cream and/or the reserved pasta water until you are satisfied with the consistency. Serve in warmed bowls or put one large bowl on the table and let everyone help themselves. If you are a condiment-type person I suggest more pepper flakes and black pepper. Some grated Parmigiano Reggiano would be delicious too.